NetStaX™ CANable Lite is a highly valuable and inexpensive tool for applications that require J1939 connectivity. This tool eliminates days, and even weeks, of troubleshooting. 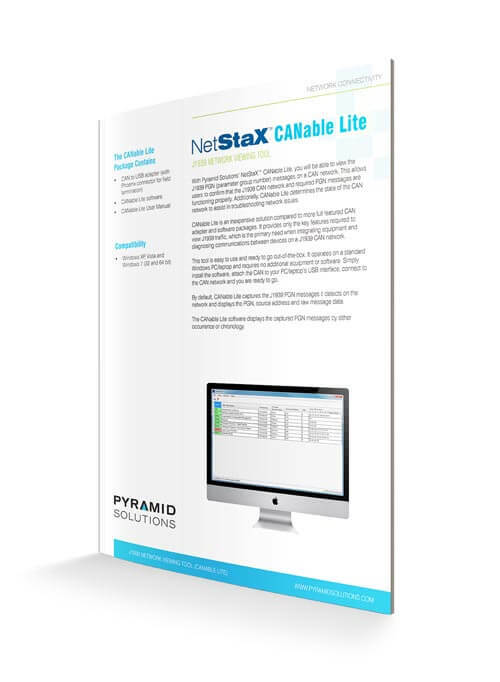 With Pyramid Solutions’ NetStaX CANable Lite tool, you will be able to quickly view the J1939 PGN (parameter group number) messages on a CAN network, taking the guesswork out of integration and troubleshooting. It captures the J1939 PGN messages it detects on the network and displays the PGN, source and destination address and raw message data. Use CANable Lite when integrating equipment and diagnosing communications between devices on a J1939 network. Setup and configuration is easy and doesn’t require a deep dive. It operates on a standard Windows PC/laptop and doesn’t require additional equipment or software. It’s as simple as installing the software, attaching the included CAN to USB interface to your PC/laptop and connecting to the J1939 (CAN) network.